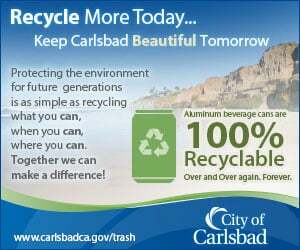 OCEANSIDE — Delivery of new trash bins, recycling bins and green waste bins began Jan. 9. The bins are part of a new trash collection system that is friendlier to the environment. Kristin Maher was in her front yard Jan. 13 when her new bins arrived. She said she was impressed by the bright new bins. Inside the bins she found instructions that explain the color system of trash in gray bins, recyclables in blue bins, and green waste in green bins. There was also information on community recycling centers for electronic waste, bulky items and hazardous waste that cannot go in the bins. The goal of the improved trash collection system is to make it easier for customers to recycle. Previously, residents had to divide their paper, plastics and glass recyclables. Now all recyclables go in one convenient container. Avid recyclers can request two extra recycling bins and one extra green waste bin per household at no extra charge. There is also a rate incentive for customers to produce less trash and do more recycling. Customers can choose a smaller trash bin and pay $2.26 less per month. The new bins work with new automated lift trucks that will roll out this year. The fleet of 42 new trash trucks is fueled by environment-friendly compressed natural gas. The trucks will expel significantly lower emissions than trucks fueled by standard gasoline. “We’re told, when fully implemented, the 42 trucks will be equal to taking 300,000 cars off Oceanside roadways each day,” Somers said. All 85,000 bins will be delivered by Feb. 4. The cost of the new bins and trash trucks is amortized in the 13-year service contract the city reached with Waste Management, effective Jan. 1, 2011. The contract also includes lowered customer rates. For more information on the new trash collection system, visit northcounty.wm.com.